There seems no better occasion than this period between the U.S. Open (Father's Day) and the British Open to discuss Tom Watson: Lessons of a Lifetime. There is nostalgia at both ends. Watson just completed what may be his final appearance in the U.S. Open appropriately at Pebble Beach, site of his momentous 1982 U.S. Open victory. He also just happened to have his son “on the bag” during the tournament. Now he is about to return to the British Open, this year being played at St. Andrews. You will, of course, remember the heart break from last year, losing in a playoff last year at age 59. In between all of this Watson has produced Lessons of a Lifetime. There are few who have learned how to play the game like Watson. He always seemed to have just the right shot at the right time. Exhibit A, of course, is the chip-in on the 17th at Pebble Beach in the last round of the 1982 U.S. Open. There is no better player to listen to and learn from concerning how to play the game. Make no mistake. This is an instructional two-disc set. It runs almost three hours and is neatly divided into two distinct parts. In Disc One Watson focuses on the fundamentals of the game (grip, setup, aim, etc.) and then gets into the golf swing. 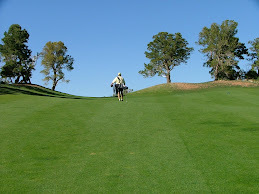 Disc Two holds the Watson specialty – the short game. In his prime there was no one better. Watson gives us the basics of the short game and also some of the intricacies around the green. This instruction is worth the price. Fittingly, Watson ends Disc Two with a tribute to his longtime friend and caddie Bruce Edwards. Anyone with a sense of history for the game is aware of the story. Have a hankie ready for this part. For any golfer, regardless of skill or involvement in the game, Lessons of a Lifetime is a must have. How could anyone pass up a learning experience from one of the greats of the game. 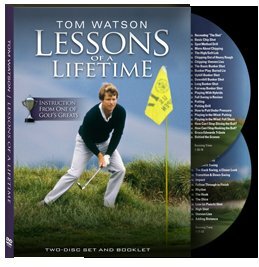 This DVD set is available at http://www.tomwatson.com/, Watson's new website. This is a place you will also want to linger for a while.